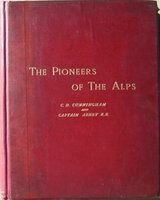 This is the first printing of the first edition of THE PIONEERS OF THE ALPS by C. D. Cunningham & Capt. W. de W. Abney. This book was published in London by Sampson Low, Marston, Searle, Rivington Limited in 1887. The book measures 334mm tall x 256mm, weighs 6 pounds, and has 287 pages, 24 photogravure plates on heavy stock paper, 8 full page plates on regular paper, 12 in-text photos, 5 small vignettes, 1 full-page plate showing 11 types of ice-axes, index. The first four chapters give a history of mountaineering from 1387 to 1885, followed by a chapter on Alpine accidents, a chapter on guideless climbing, a chapter on winter mountaineering, a chapter on ice-axes and ropes, and a chapter on guiding. The rest of the book consists of 35 chapters, each giving a biographical description & climbing highlights of a famous early climbing guide. Abney, a scientist who helped advance photographic chemistry, developed a new method to produce the photogravures included in this book, making this one of the first books to have photogravure images printed directly on the plates with stable “printers’ ink”. 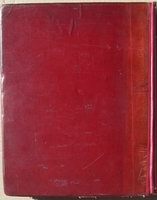 CONDITION: Original maroon cloth, new cloth spine, gilt lettering front cover & spine. The book has been rebacked with a new cloth spine. 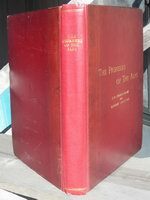 The spine on the big, heavy book usually has severe cracking and fading issues, so it is not unusual to find the spine renewed or relaid on this book. There is some rubbing at the corners and lower edge (see photos), minor cover soiling (not staining), minor lifting of cloth on the front and rear (not bad). The binding is solid and tight. The book has no foxing (sometimes an issue with this book) and the photogravure plates are exceptionally bright. There are no previous owner marks or stamps in the book other than the very tiny "BAUME" stamp on the inside corner of the rear pastedown. The "BAUME" stamp indicates that this book was from the collection of or sold by the legendary British antiquarian mountaineering bookseller, collector, & bibliographer, Louis Baume. He would usually put his little stamp (8mm x 2mm) at this location in the important books that he collected or sold. This is not an ex-library book. Price: SOLD.